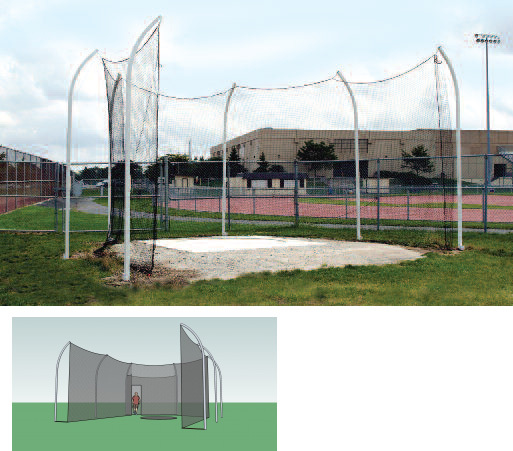 Cage is NFHS compliant and designed to the 34.92 degrees throwing sector configuration. Cage includes main net and ground sleeves. CAGE POLES Net poles are A513 steel that are powder coated for extra rust resistance. Poles are 14' tall with a rolled offset for safety. MAIN NET High school discus cage nets are made of a nylon 6 material with a 180 lb break strength. All nets are UV stabilized to help increase life span. Net height for all high school cages is 13'6". WE WILL CONTACT YOU ABOUT FREIGHT CHARGES AFTER ORDERING.